. . . and babies make four. : They've Been Booed. The girls and I delivered our "Boo Basket" to our neighbors today. Since it was the middle of the day on Sunday, we didn't ring the doorbell because I was sure we'd get caught if we did. We did very stealthily go and peek at their porch later in the day and the basket was gone and the "We've Been Booed" sign was on the door. 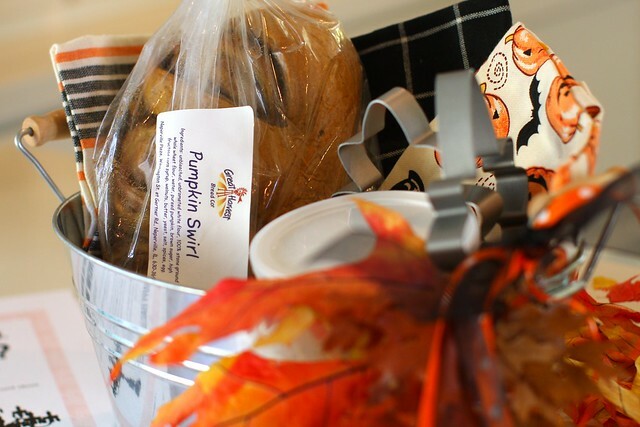 Our basket included a loaf of pumpkin swirl bread from Great Harvest, a tin of pumpkin waffle and pancake mix, a maple leaf and oak leaf pancake mold and three Halloween dish towels. We put it all in a tin container from Target tied with maple and oak leaves and some orange and black ribbon. I also rolled up the note and the sign and tied them with the same orange and black ribbon. If you have a Great Harvest Bakery anywhere near you, go buy a loaf of pumpkin swirl bread! It is absolutely divine. I want to be your neighbor so u will BOO me!!!! So cute!!! !